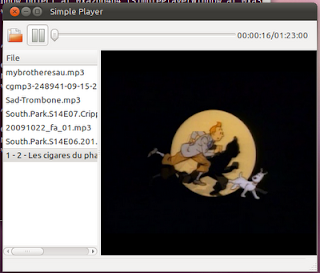 In this tutorial you will build a simple media player. 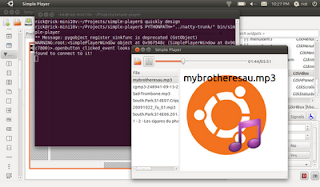 It will introduce how to start projects, edit UI, and write the code necessary to play videos and songs in Ubuntu. The app works by letting the user choose a directory. Simple Player then puts all the media into a list. The user can choose media to play from that list. This tutorial uses Quickly, which is an easy and fun way to manage application creation, editing, packaging, and distribution using simple commands from the terminal. 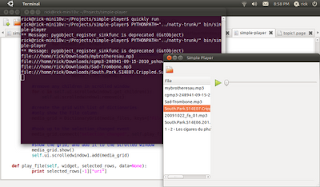 Don't worry if you are used to using an IDE for writing applications, Quickly is super easy to use. 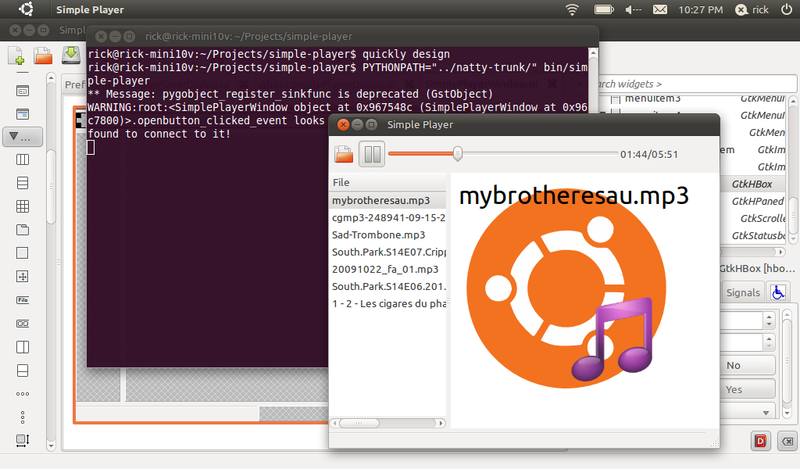 This tutorial is for Ubuntu Natty Narwhal (11.04). There are some key differences between 10.10 and 11.04 versions of Quickly and other tools that will make it hard to do the tutorial if you are not on Natty. So, probably best to make sure you are running 11.04. Note that these are alpha versions, so there may be bugs. 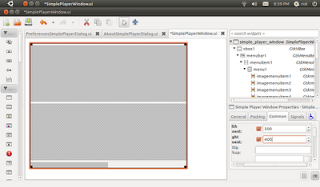 In Python, white space is very significant, especially in terms of indentions. In HTML, white space is not. 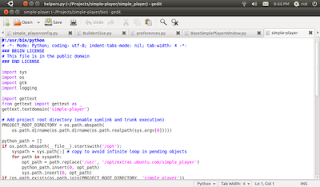 As a result, Blog postings frequently mangle Python code, no matter how carefully a blogger might format it. So while you're following along, be careful about copying and pasting out of here. This will create and run your application for you. 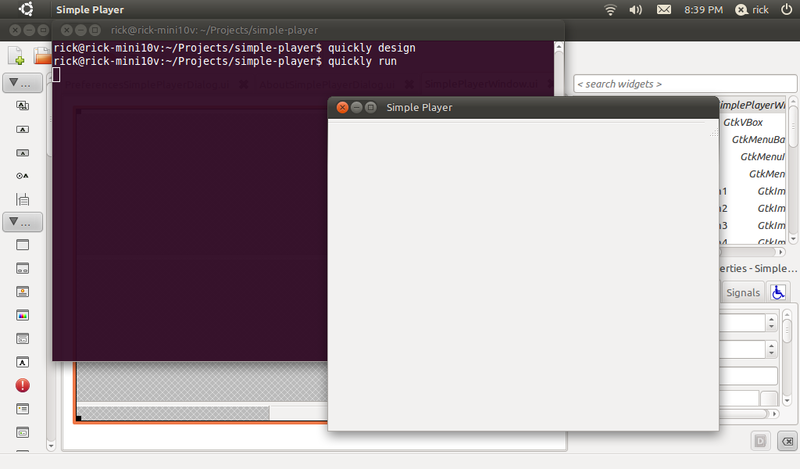 Notice that the application knows it is called Simple Player, and the menus and everything work. 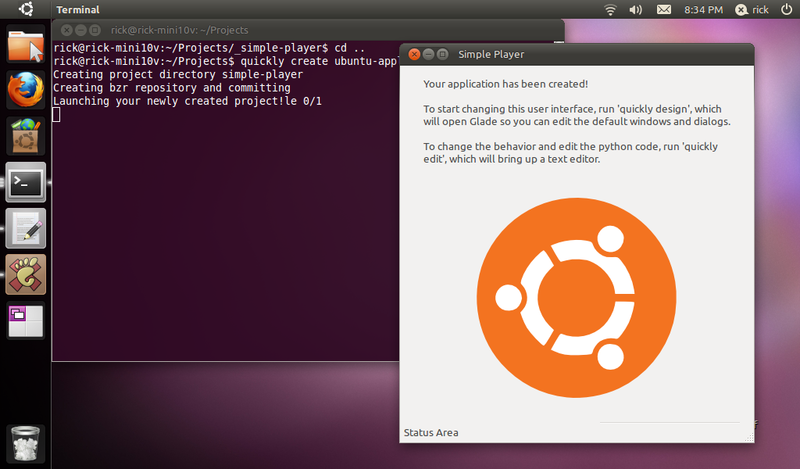 If you just try to run Glade directly, it won't work with your project. Now, we want to make sure the window doesn't open too small when the app runs. 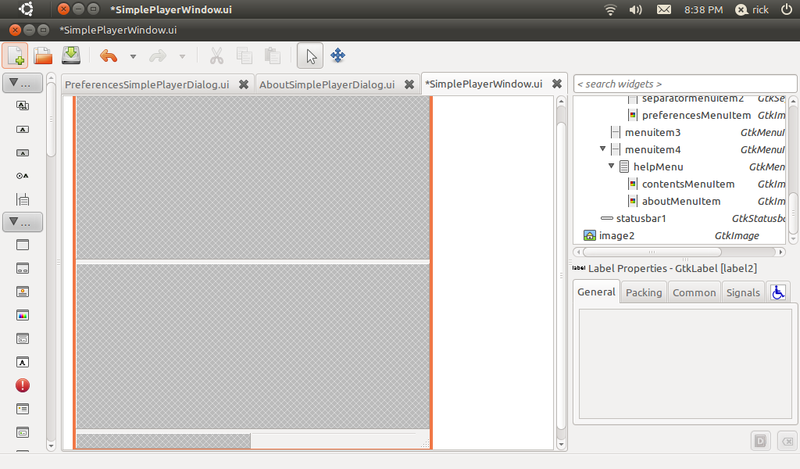 Scroll to the top of the TreeView in the upper right of Glade, and select simple_player_window. 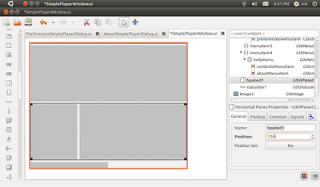 Then in the editor below, click the common tab, and set the Width Request and Height Request. 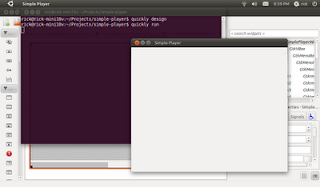 There's also a small bug in the quickly-application template, but it's easy to fix. 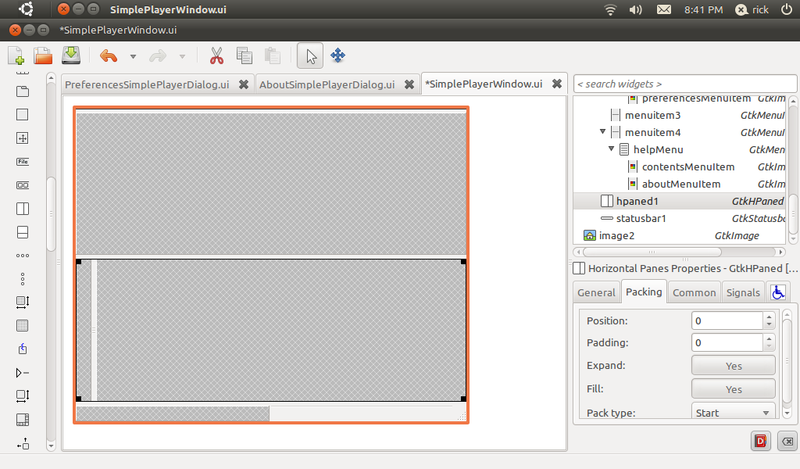 Select statusbar1, then on the packing tab, set "Pack type" to "End". A nice blank window, ready for us to party on! The main part of the user interface is going to have an area that divides between the list of media and the media when it is playing. There is widget for that called HPaned (Horizontal Paned). 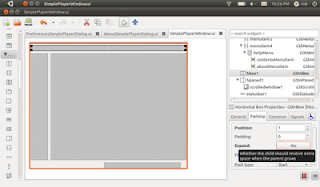 Find HPaned on the toolbox on the left, and click on it to active paint mode. 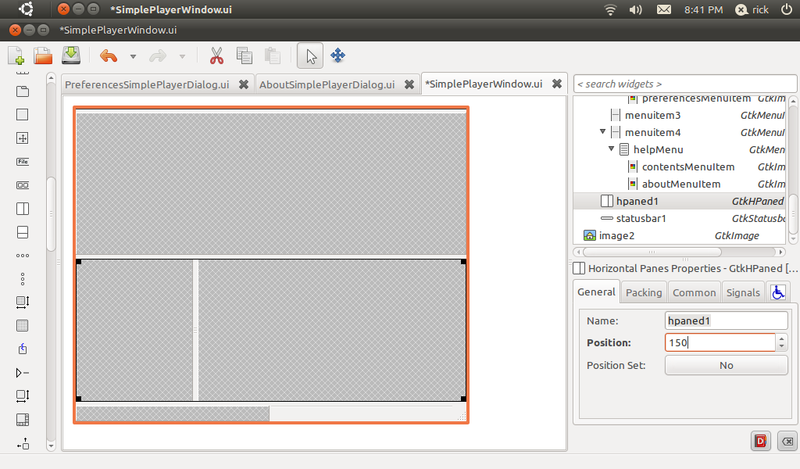 Then click into the second open space in the main part of the window. This will put the HPaned in the window for you. Make sure the HPaned starts out with an appropriate division of space. Do this by going to the General tab, and setting an appropriate number of pixels in Position property. The user should be able to scroll through the list, so click on ScrolledWindow in the toolbar, and then click in the left hand part of the HPaned to place it in there. Now add a toolbar. 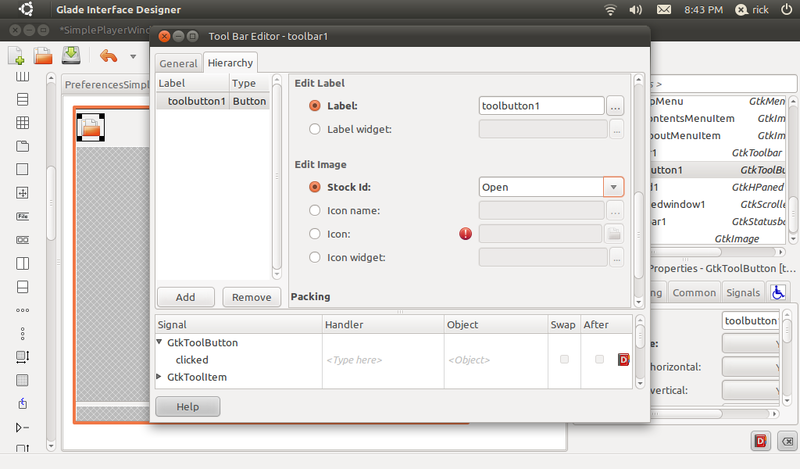 Find the toolbar icon in the toolbox, click on it and click in the top space open space. 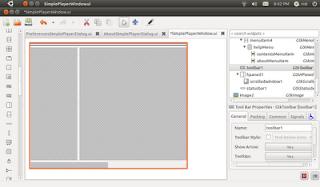 This will cause that space to collapse, because the toolbar is empty by default. To add the open button click the edit button (looks like pencil) in Glade's toolbar. 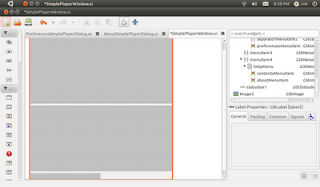 This will bring up the toolbar editing dialog. Switch to the Hierarchy tab, and click "Add". 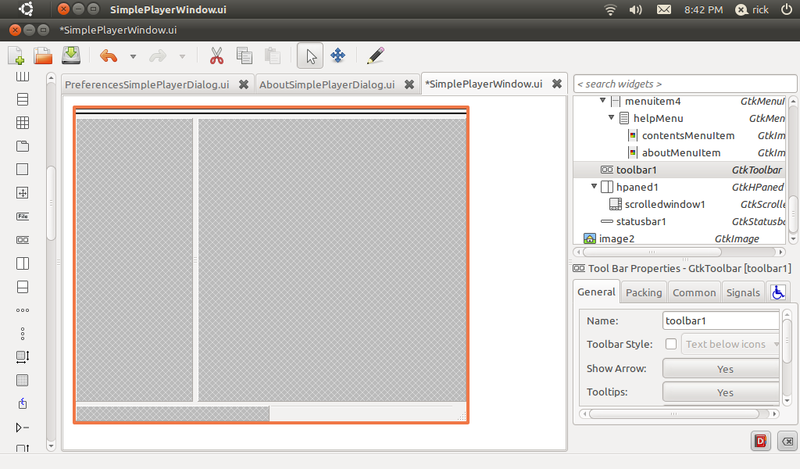 This will add a default toolbar button. To turn this default button into an open button, first, rename the button to openbutton (this will make it easier to refer to in code). Then under Edit Image set Stock Id to "Open". That's all you need to do to make an open button in Glade. Due to a bug in the current version of Glade, you might need to rename your tool bar button again. When you close the editor, look in the treeview. If the button is still called "toolbutton1", then select it, and use the general tab to change the Name property to "openbutton". Then save again. Now if you use $quickly run again, you'll see that your toolbar button is there. The open button will have an important job. 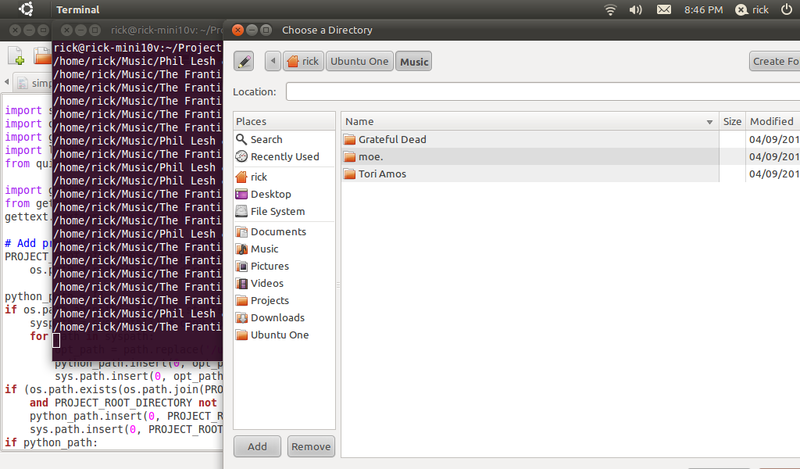 It will respond to a click from the user, offer a directory chooser, and then build a list of media in that directory. So, it's time write some code. This will open your code Gedit, the default text and code editor for Ubuntu. 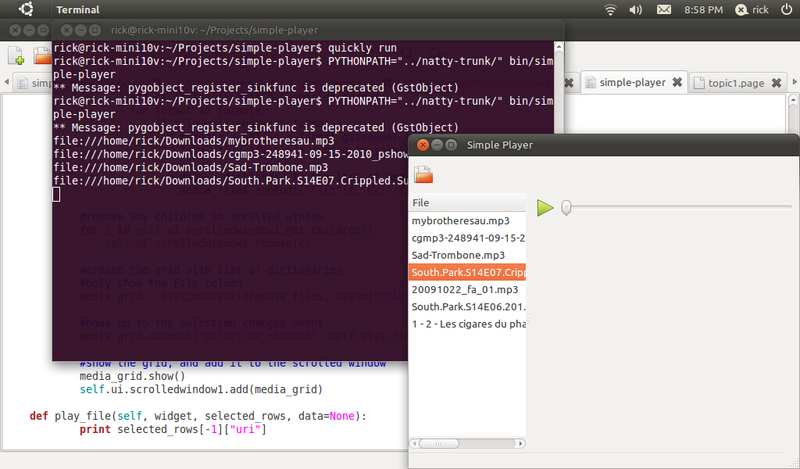 Switch to the file called "simple-player". 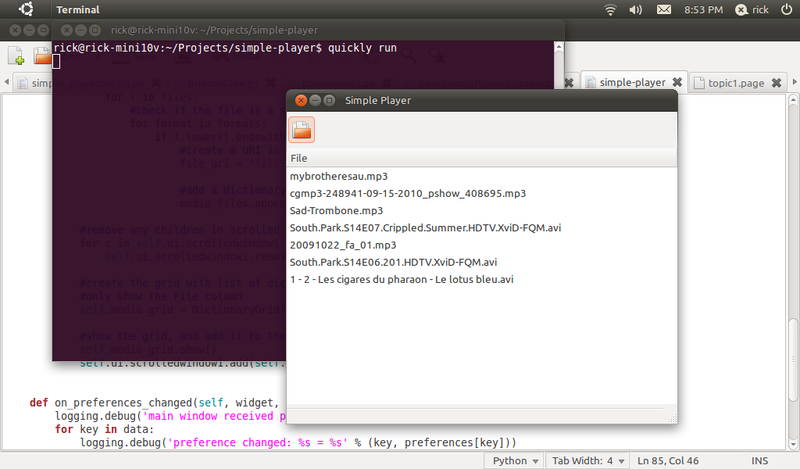 This is the file for your main window, and the file that gets run when users run your app from Ubuntu. Put this function under "finish_initializing", but above "on_preferences_changed". Save the code, run the app, and when you click the button, you should see "OPEN" printed out to the terminal. Sometimes a signal handler will require a different signature, but (self, widget, data=None) is the most common. Now when you run the app you can select a directory, and it will print a full path to each file encountered. Nice start, but what the function needs to do is build a list of files that are media files and display those to the user. GStreamer supports a lot of media types so ,of course, you can add more supported types, but this is fine to start with. This will now only print out files of supported formats. 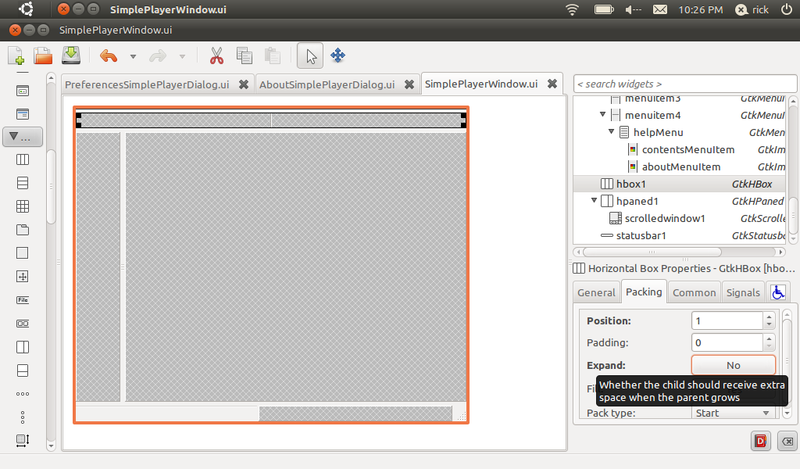 Simple Player will create a list of dictionaries. Each dictionary will have all the information that is needed to display and play the file. Simple Player will need to know the File name to display to the user, a URI to the file so that the file can be played, and the type of media. So, we'll create a list and add a dictionary to each support type to it. 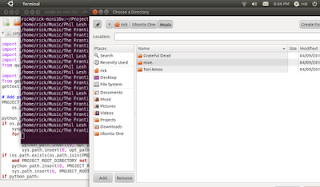 Now the list is displayed when the user picks the directory. to control the visibility of the controls. 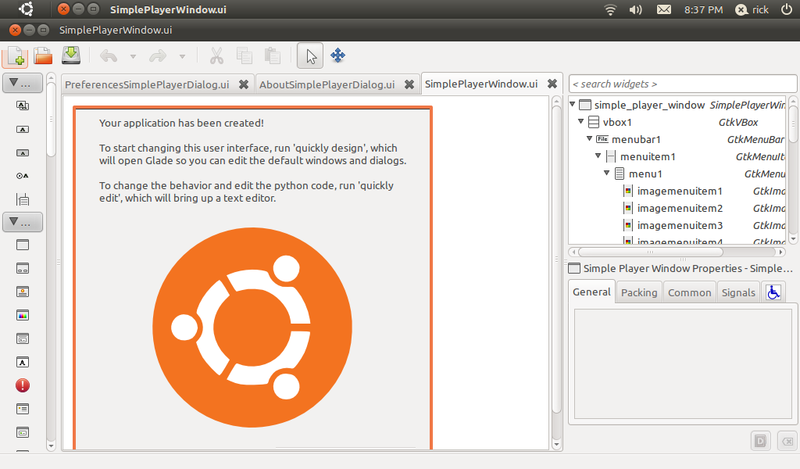 Since we'll be accessing it a lot, we'll create as a member variable in the SimplePlayerWindow class. Then to put it in the right hand part of the HPaned, we use the add2 function (add1() would put it in the left hand part). Notice that the signature for the function is a little different than normal. When the DictionaryGrid fires this signal, it also passes the dictionaries for each row that is now selected. This greatly simplifies things, as typcially you just want to work with the data in the selected rows. If you need to know more about the DictionaryGrid, it passes itself in as the "widget" argument, so you can just work with that. All the function does now is get the last item in the list of selected rows (in Python, you can use -1 as an index to get the last item in a list. Then it prints the URI for that row that we stored in the dictionary back in openbutton_clicked_event. Now users can click on Videos and movies, and they will play. Since we decided to show the MediaPlayerBox's controls when we created it, we don't need to do any work to enable pausing or stopping. However, if you were creating your own controls, you could use player.pause() and player.stop() to use those functions. Notice that when playing a song instead of a video, the media player is blank, or a black box, depending on whether a video has been player before. It would be nicer to show the user some kind of visualization when a song is playing. The easiest thing to do would be to create a gtk.Image object, and swap it when for the MediaPlayerBox when an audio file is playing. However, there are more powerful tools at our disposal that we can use to create a bit richer of a user experience. This section will use a GooCanvas to show you how to compose images and text together. A GooCanvas is a very flexible surface on which you can compose and animate all kinds of 2D experiences for users. This tutorial will just scratch the surface, by combining 2 images and some text together. 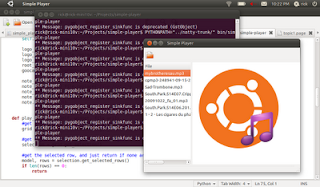 We'll show the Ubuntu logo image that is already built into your project, but a musical note on top of that for some style, and then put the current song playing as some text. The goocanvas will only be added to the window when there is an audio playing file, so don't pack it into the window yet. But let's an image to the goocanvas so we can make sure that we have the system working. 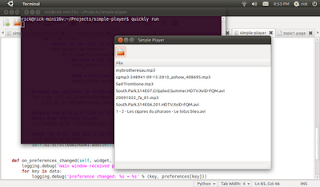 Remember for this to work, you have to put a note.png file in the data/media directory for your project. If your image is a different size, you'll need to tweak the x, y, and scale as well. A goocanvas.Image is a goocanvas.Item. There are different kinds of Items and many of interesting visual things you can do with them. There are items like shapes and paths. You can change things like their scale, rotation, and opacity. You can even animate them! One kind of goocanvas.Item is goocanvas.Text. You create it like a goocanvas.Image. We won't use any text when we create it, because that will be set later when we are playing a song. 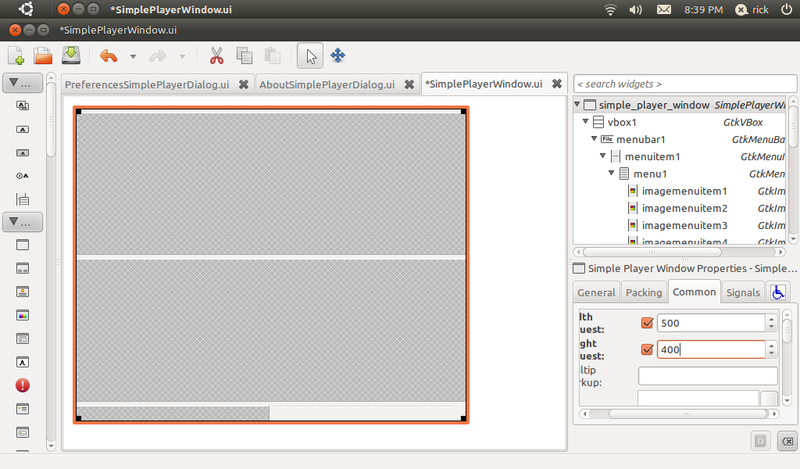 Since the goocanvas.Text will be accessed from the play_file function, it should be a member variable for the window. 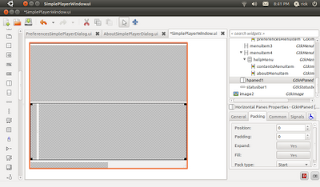 So after adding the note image in the finish_initializing function, you can go ahead and add the text. Now when an audio file is playing the title shows. You've probably noticed a pretty bad bug, when an audio file is playing the user can't access the controls for the media player. Even if that were not the case, are 2 toolbars, one for the controls, and one that only has the openbutton. Also, the controls are shifted over because of the DictionaryGrid, so the time labels are not visible by default. To start, go back to Glade, and delete the toolbar you added before. Replace it with an HBox. When prompted, set Number of Items to 1. It should be named hbox1 by default. After adding the HBox choose the packing tab, and set Expand to "No". Otherwise, the HBox will take up all the room it can, making the toolbar huge when you add it back in. We still want the open button to be a stock button. 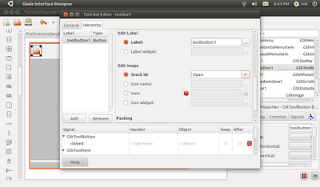 For gtk.ToolButtons, use the set_stock_id function to set the right stock item. Then show the button, and connect it to the existing signal handler. Now users can use the controls even when audio is playing! This tutorial demonstrated how to use Quickly, Quickly Widgets, and PyGtk to build a functional and dynamic media player UI, and how to use a goocanvas.Canvas to add interesting visual effects to your program. The next tutorial will show 2 different ways of implementing play lists, using text files, using pickling, or using desktopcouch for storing files. Then you can browse the pydocs by opening your web browser and going to http:localhost:1234. Search for quickly, then browse the widgets and prompts libraries. Since MediaPlayerBox is not installed yet, you can look at the doc comments in the code for the modules in natty-branch/quickly/widgets/media_player_box.py. 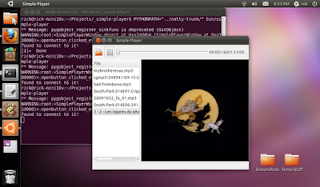 MediaPlayerBox uses a GStreamer playbin to deliver media playing functionality. 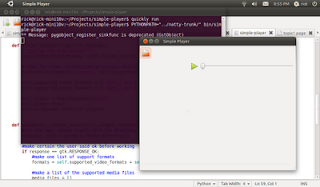 GStreamer si super powerful, so if you want to do more with it, you can read the docs. 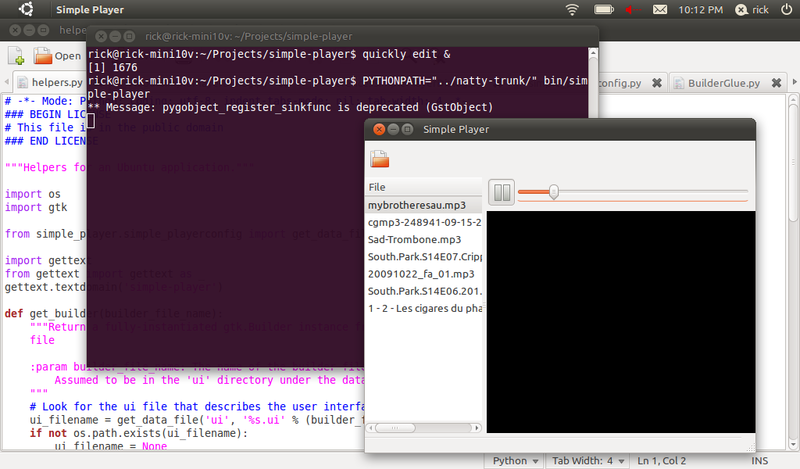 Playbin Documentation (you can use self.player.playbin to get a reference to the playbin). Thank you for this! 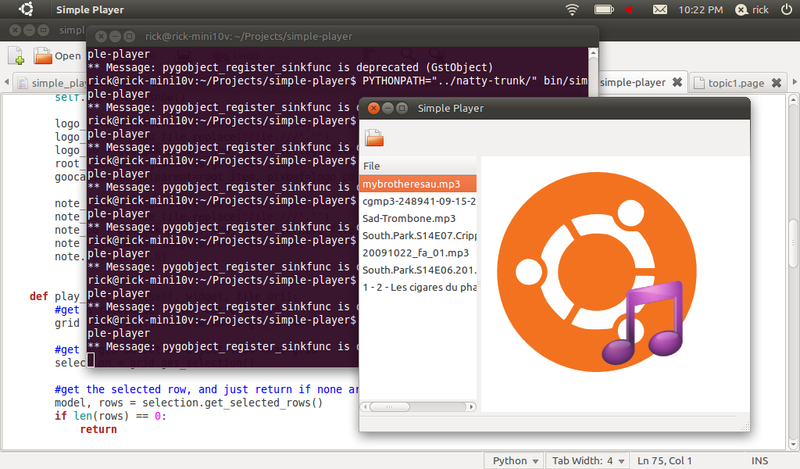 I have long said that Ubuntu needs to focus on being a platform separate from the rest of the Linux ecosystem, with a preferred toolkit, language, and development environment. Too many times, I have seen new devs in the forums asking "where do I start?" QT or GTK+? C, Python, or Ruby? GEdit, Eclipse, Vim, or Emacs? The answers in the forum are conflicted and never clear. You are going to answer these questions definitively. 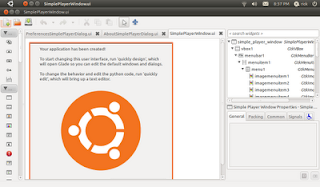 If we get GEdit plugins for Quickly and something like Mission Control in order to allow easy PPA publishing from a standard interface, the ecosystem will flourish. 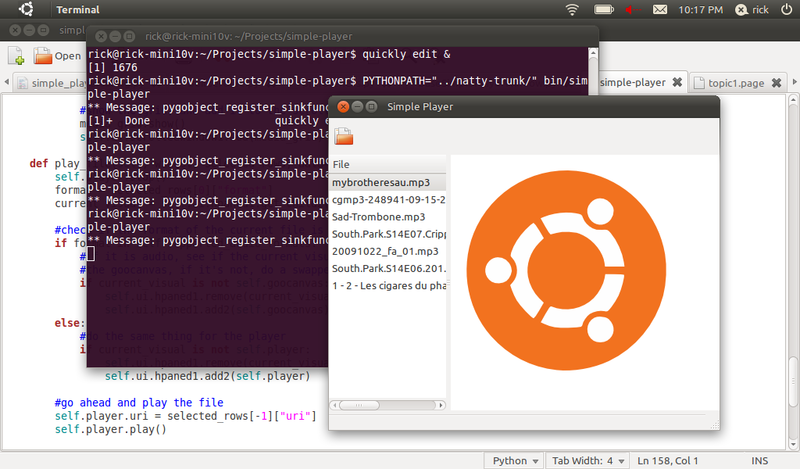 In five years, the success Ubuntu sees will be due in large part to you. I'm starting to realise that there is nothing Quickly can't do... can it make me a coffee? 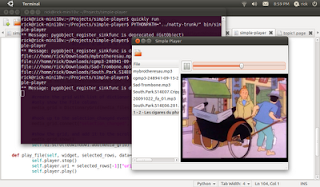 Man, just an opinion: "Why don't You do a tutorial series about the basics programming in Python + GTK+?"... It will be great! Thanks for the share. Keep posting such kind of information on your blog. Keep posting such kind of information on your blog. I bookmarked it for continuous visit. In my case, show up the messege: cannot import name prompts.